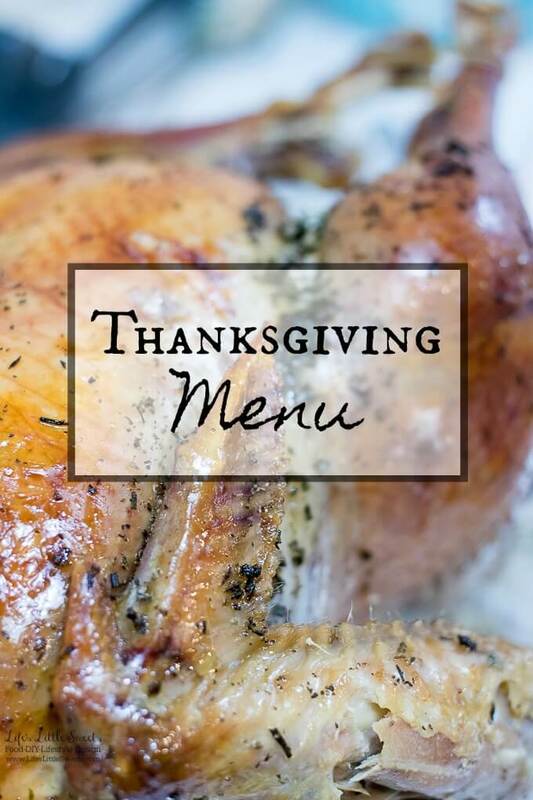 Thanksgiving Menu – We are sharing our Thanksgiving Menu for 2017. Hi Everyone, how was your Thanksgiving? What was your favorite side dish? After all that Thanksgiving preparation, the holiday is over and now we are looking towards Christmas. I just want to share what our family had for Thanksgiving. It was our first Thanksgiving hosting. We had just our family of four and our father-in-law over for the dinner. It was a great first Thanksgiving and everything turned out amazing. It took a couple days of prep and cooking with just me doing all the cooking – amazingly, it was doable. Eric and his dad did the grocery shopping so I could stay home with the kids which was nice. Since we had a small group for Thanksgiving, I didn’t go nuts with a multitude of dishes and I stuck to the basics. I was planning on doing a pumpkin pie but I just didn’t get to it which was my only disappointment but it really didn’t matter because we had tiramisu, a family favorite. I’m planning to share the recipes for all the below dishes that we served and as I share them on the blog, I will come back and link to them here in this post. Herb Dry Brined Turkey (20 pounds, organic) – I dry brined our turkey the day before roasting it and it came out amazing. I highly recommend the dry brine because it’s pretty easy and not too messy a way to prep a turkey. Try our Green Bean Turkey Casserole. Zesty Orange Cranberry Sauce – This version of cranberry sauce was bright, flavorful and so good with the turkey and sides. Try our Rosemary-Infused Cranberry Sauce. Homemade Stuffing/Dressing – I made a homemade stuffing/dressing with herbs from the garden. It came out so good and I can’t wait to share the recipe on the blog! Do you call it stuffing or dressing? I grew up calling it stuffing even if it is prepared outside the turkey; I grew up in New England though and I think in other parts of the country they call it dressing. I am interested to know what is most common. Homemade Turkey Gravy – I made our gravy from scratch using the pan drippings and a broth from the turkey neck and gizzards. Homemade gravy is the best! Roasted Brussels Sprouts – These are one of my husband’s favorite vegetables, so, of course, they had to be at the Thanksgiving table. Try our Pan-Fried Bacon Brussels Sprouts. Mashed Sweet Potatoes – I love having a veggie side with a sweet taste to balance out all those savory side dishes. Check out Herbes de Provence Roasted Sweet Potatoes, Oatmeal Cookie Marshmallow Sweet Potato Casserole. French Baguettes – My father in law brought some french bagettes from a local bakery. They were so crusty and good. Check out our No-Knead Bread. Whipped Potatoes (Yukon Gold) – Whipped/mashed potatoes are a must for me at Thanksgiving, check out Perfect Sage Thyme Butter Whipped Potatoes, Homemade Mashed Potatoes. Tiramisu – Eric’s dad, Michel, brought the Tiramisu which was great (from Costco). I personally love Tiramisu (one of my favorites! ), if you need a Tiramisu recipe, check out Mason Jar Tiramisu Trifle. Pecan Pie – Eric’s sister, Nicole, didn’t have dinner with us because she went to our other relatives dinner but stopped by after dinner and brought a pecan pie. Check out Easy Pecan Pie, Pie Recipe Collection.